[by Dean Smith] It doesn’t happen very often, so when it does we need to talk about it. Creationists and evolutionists are in agreement on some facts about snakes. As I read this story on the evolution of snakes there was the usual rhetoric of snakes being a 110 million years old — a point of contention for creationists considering scientists are now finding organic, non-fossilized cartilage and blood in dinosaur bones. It is hard to fathom how there could be non-fossilized material in any bones supposedly 70 million years old. 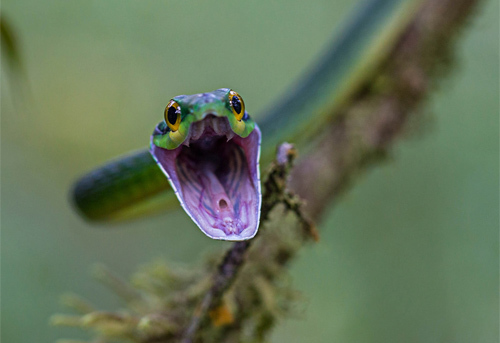 Scientists from Yale University in the US initiated a study of snakes to discover their origins. Looking at modern snake DNA and anatomy plus recent fossil finds, they concluded that at one time snakes had hind legs and front legs. Basically snakes walked. According to evolutionary theory, sometime around 110 million years ago, snakes suddenly lost their legs and appeared as we know them today, slithering on the ground. However, the thing that puzzles scientists is the sudden appearance of snakes. Actually, it is not only snakes. This sudden appearance of animals has been a chronic problem for evolutionists. In fact, they even have a name for it. They call it the Cambrian Explosion where the fossil record shows animals explosively appearing in mass, fully developed, with no evidence of evolution. This is a huge problem for evolutionists. But it is exactly how the Bible said it happened. God created them all at the same time, on the same day. It has been so problematic there are even incidents where evolutionists have taken fossils and added parts to them to give the appearance of evolution. I recently posted how they did this to whale fossils hanging in major museums around the world. They have no qualms doing this, because they believe this is what happened. They have faith. But oddly the Bible agrees with evolutionists on snakes. When God first created them, they walked on legs. After the snake deceived Eve in the Garden of Eden, God judged the serpent. The Lord God said, “Because you have done this, cursed are you more than all cattle and more than every beast of the field, on your belly you will go and dust you will eat all the days of your life. (Genesis 3:14 NASV). So it seems that at one point, snakes had legs because God’s judgement forced them to a life on their bellies. There was no evolution, it just happened. It is known that humans have a particular fear of snakes, but it is difficult to explain why humans would have a greater fear of snakes than say any other carnivorous animal such as tigers, wolves or bears. The reason is God put it there. This isn’t the first time there has been common ground. One popular theory on the formation of the universe is the big bang theory. According to this theory, the current mass of our universe was created by an explosion of a compacted form of energy smaller than the size of a thimble (yes, a thimble). As a result of this explosion, the current mass of the universe (all the solar systems, stars, and planets) was created in literally a micro second of a micro second (yes, a second). Of course, this fits the Biblical record perfectly, as God created the universe and all the stars and planets by instantaneously speaking them into being.